WAIT! DID YOU REGISTER FOR THE 100% FREE BULLYPROOF SEMINAR + BONUS REPORT? Enter Your Information Below... BullyProof Your Child Today! You Know They're Worth it! BullyProof Certification Seminar + Bonus Report! 100% FREE! 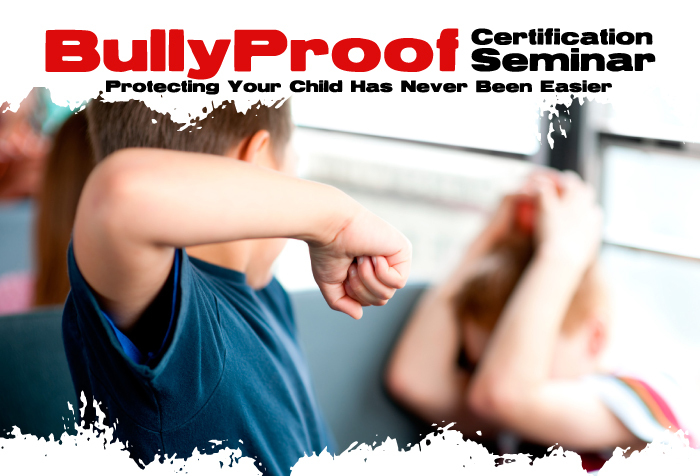 This Seminar WILL Stop Your Child From Being a Victim... EVER! Would You Like To Learn How To Keep The “School Bullies” From Stealing Your Child’s Confidence and Self Esteem Forever? You Know They’re Worth it! Bullying is the number one social issue in schools today! a Problem at their School! are Being Emotionally or Physically Injured Due to Bullying. assertively and confidently stand up to bullying and teasing. resolve conflct and deal with violence!